Today Redlands City Manager, Enrique Martinez, will enlighten us about projects, priorities and progress in our fair City. TODAY University of Redlands alumnus and Redlands Mayor PETE AGUILAR will present a “state of the City of Redlands” program. 19 Sep Students of the Month! TODAY It’s time once again for Craft Talks! 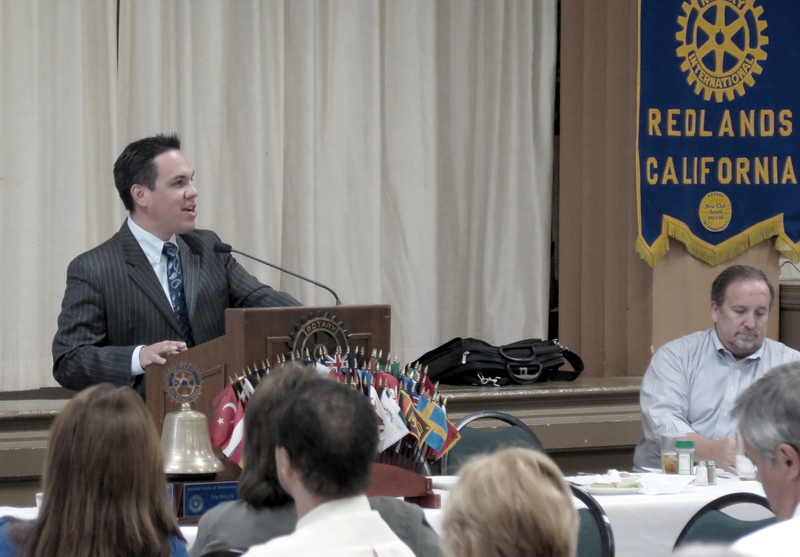 LAST WEEK New York native and past business reporter for the Riverside Press-Enterprise JACK KATZANEK, Senior Director of Communications from the Inland Empire Economic Partnership, informed the Club about his read on the economics of the Inland Empire. Fortunately for the region, he sees evidence of a positive outlook for the Inland Empire in 2014. TODAY Today we hear from PAUL CHABOT. Born in Loma Linda, he began serving in the military in 2001, first at the Office of Naval Intelligence and later with the Defense Intelligence Agency. He is an Iraq War veteran and currently serves with the United States Navy Reserve. TODAY Ron Jeffrey will lead a special program focused on Club membership, a subject that will also be addressed at District 5330’s Leadership Institute on September 27th. TODAY Today’s speaker is Patrick Manyika of Rwanda, who survived refugee camps and Rwanda’s civil war. He went on to graduate from the University of Redlands, a now works with Esri. He will talk about the International Friendship Connection (IFC), an organization of volunteers which cares for incoming international students at Cal State San Bernardino, the University of Redlands, and Loma Linda University. He will also talk about his own experiences. TODAY District Governor Shab El Awar (San Bernardino Sunset Club) and wife Dr. Bricia El Awar will pay us a visit to talk about District 5330’s priorities, Rotary International’s efforts, and, no doubt, membership issues for the coming year.